While you have a single picture opened you can click on the top left corner for "Full Screen". Also while on a picture, not a full screen view, there is a magnifier you can click on to magnify a section of the picture. Then a plus sign to magnify more if you wish. There is also a slider at the bottom right to change the amount of magnification.This is especially helpful when viewing small items in the photograph such as small faces in a class photograph. To move from picture to picture, you can click the left and right arrows on the screen. However, a simpler way to move from picture to picture is to click the left <- and right -> arrows on your keyboard. For videos there is a full screen expansion device at the bottom right corner of the video screen. To reduce the size of browser menus on a PC and make the pictures larger, press F11. Press F11 again to restore browser menus. 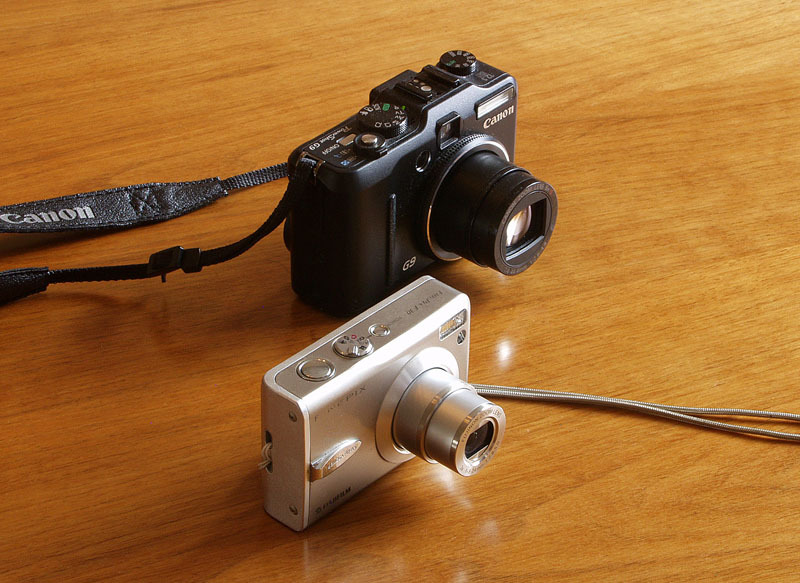 Note on cameras used for all new photographs and videos: The camera on the left is a Fuji FinePix F30 and the camera on the right is a Canon G9. After many years using film cameras (Leica rangefinder cameras, Hasselblad standard and wide angle cameras, Nikon 35 mm cameras, Sinar 4x5 inch and 8x10 inch view cameras), I have decided to go with very compact digital cameras only. I do have an Olympus E-20N, my first digital camera from 2002, which I no longer use because of large size and low megapixel count. The Canon is a really excellent camera for outdoor pictures where low iso settings can be used or where some sort of dffuse flash can be used for illumination. These images are so sharp that they can be severely cropped and still give excellent results. It has a sensitivity range from 80 iso to 1600 iso. However, anything using a sensitivity range setting above 400 iso produces pretty pathetic results in term of picture noise. What it does have is a viewfinder that allows you to frame pictures at very short notice and in bright light where a viewing screen is of little value, especially for small objects. This viewfinder feature, that this camera has, is sadly lacking on most compact cameras. The optical image stabilization is especially useful and successful when shooting in the video mode, even in rather dim light conditions. The FujiFilm camera is a little wonder that produces really excellent results up to 1600 iso and sharp but acceptable grainy results at 3200 iso. The viewing screen is large and non-reflective and this makes it especially pleasant for indoor conditions. If you look at the panoramic photograph taken at the art gallery in Copenhagen, you can see just how effective it can be when there is almost no usable light for photographs. The only lights in the gallery were the candles in candelabra on the tables and a small ceiling exit light which contributed almost nothiing to the lighting of the room. Because of the lack of image stabilization, the video tends to be very jumpy with this camera.